Office of Foreign Missions License Plates. Top Embossed (left) and flat 1984 baseplates. No data to suggest to which embassies YA- and CM-series numbers were assigned on this base, issued from 1984 through 2007, is known. Left PL-series numbers are thought to be assigned to the Chilean embassy, but definitive information as to which two-letter codes are assigned to various embassies is classified. 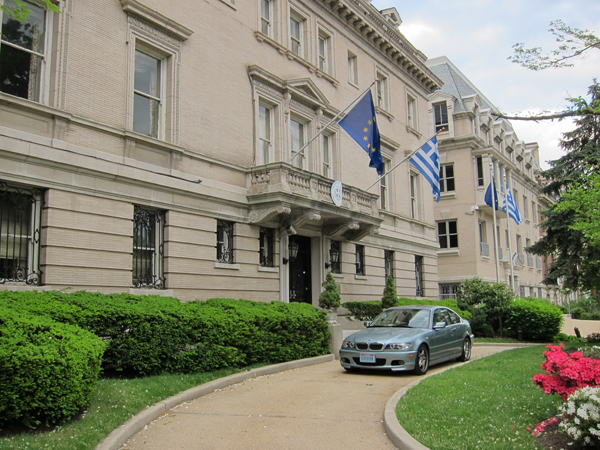 Diplomatic license plates issued by the federal government are addressed on this site because they are so much in evidence in the District of Columbia and because their history has not been addressed elsewhere. They are issued by the Office of Foreign Missions (OFM) in Washington and through its several field offices throughout the United States. Since the dawn of the twentieth century when motor vehicles were first used and registered, and in contrast to many other countries, the federal government in the United States has always left the registration and regulation of privately-owned motor vehicles to local jurisdictions, most notably state and territorial governments. By the mid-1980s, many U.S. jurisdictions were issuing specially-marked license plates for foreign representatives. Some, like California, New York, and Washington, D.C, issued them by the thousands during multiple decades. Others, such as New Hampshire, issued only a few over a short period of time. It all came to an end when the federal government announced in mid-1984 that the registration of vehicles operated by most official representatives of foreign countries (all except honorary consuls) would soon be concentrated in a new agency within the U.S. Department of State. Provide the appropriate privileges, benefits, and services in a reciprocal basis to the foreign mission community in the U.S.
Establishing and maintaining reciprocal agreements between national governments is central to OFM operations. On its Web site the agency indicates that it emphasizes reciprocity in order to facilitate “fair treatment of U.S. personnel abroad while assuring foreign diplomats based in the United States receive the same treatment that each respective government provides in return.” In addition to fostering mutual respect among nations through their diplomatic corps, the OFM also handles such tasks as the issuance of drivers licenses and vehicle titles, registrations, license plates; processing of tax exemption and duty-free customs requests, and assisting in the purchase of U.S. property by foreign governments. The existence of diplomatic immunity and the various forms in which it was invoked as it relates to personal liability for motor vehicle infractions committed by U.S.-based representatives of foreign nations in the 1970s and 1980s led to the enactment of new laws designed to protect U.S. citizens. In a high-profile 1974 case, Dr. Halla Brown, a medical faculty member at George Washington University, was paralyzed from the neck down in a vehicle crash caused by a Panamanian cultural attaché. Diplomatic immunity meant that despite her large medical bills she had no legal recourse against the Panamanian government. Four years later, at about the same time that Dr. Brown received a $100,000 payment from the government of Panama, Congress passed the 1978 Diplomatic Relations Act, requiring that diplomats carry liability insurance. Late in 1983 Congress passed the Foreign Missions Amendment Act, which compelled the then-new OFM to set and enforce vehicle liability insurance standards for diplomats. In order to fulfill the enforcement provision of this mandate, State Dept. officials announced in late May 1984 that the OFM would soon begin the transition from state-issue diplomatic plates of various types and designs to a series of uniform red, white and blue plates that it would issue and control. 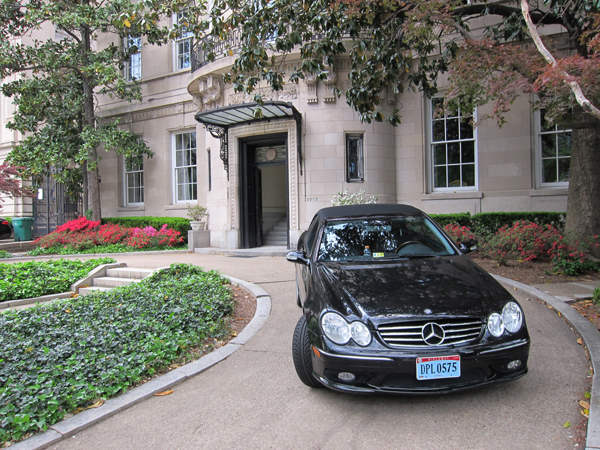 At the time, the lowest-numbered Washington, D.C. diplomatic plates were assigned based upon tenure within the diplomatic corps. 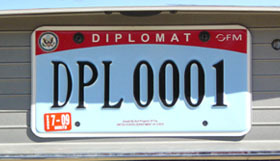 Soviet ambassador Anatoly Dobrynin had registration DPL 1 when OFM plates were introduced. Details of the actual timeline of relevant events are not presently known, but a May 1984 Washington Post article indicates that vehicle registration-related efforts were soon to begin. “Federal titling will take place in midsummer and a system to enforce liability requirements by year's end, according to Ralph Chiocco, a State Department operations officer.” Elmer Brown, a former DMV director in California, assisted the OFM as it got into the vehicle registration business. “This is one of the few federal programs…that the states will look at with a good bit of pleasure,” said Brown, indicating that licensing diplomats and registering their vehicles had long been an arduous task. Although the exact introduction date of OFM plates is uncertain, it almost certainly occurred in July or August of 1984. A June 23, 1984, Washington Post article indicates that “Beginning next month, the Office of Foreign Missions will issue 2,000 plates a month until all 24,000 automobiles registered to foreign missions have the plates.” From an Associated Press story that appeared in the New York Daily News on Jan. 7, 1985, comes this statement: “The State Department began registering all diplomatic vehicles and assigning the license plates to foreigners last August.” The earliest plates, presumably all of the 24,000 or so distributed during 1984 and 1985 to replace special plates reportedly issued by 28 states as well as the District of Columbia, feature embossed characters on a reflective white background, portions of which are painted red and blue. Note that these plates are not made with graphic reflective sheeting, as are later issues, but rather plain white sheeting with the blue and red features silk-screen printed. There is no security mark in the sheeting of these first plates, which were made at Lorton Correctional Complex in suburban Fairfax County, Virginia. Also noteworthy on the earliest plates is the legend “Issued By The UNITED STATES DEPARTMENT OF STATE,” whereas on later plates this legend was made more bold and modified to read “Issued By And Property Of The UNITED STATES DEPARTMENT OF STATE.” When changes were made to various characteristics of the embossed variety of the 1984 baseplate is unknown. Since their introduction, all full-size OFM plates (i.e. aside from the few motorcycle plates issued) have been issued in pairs. By late October 1984, when only about 25% of the new plates had been distributed, their being stolen was apparently already a problem. Mention of this in the December 1984 issue of the ALPCA Newsletter indicates that Special Agent Lawrence Whitaker, of the Federal Bureau of Investigation, designed the first OFM plates, although this information has not been confirmed. The absence of 1984 baseplates in collections today and their having been removed from service no later than the final day of 2008 now make it almost impossible to draw conclusions about their physical characteristics based upon observation. Personal observations and photographs show that a later style of the 1984 design features flat, not embossed characters, and these plates were made with DLP (Digital License Plate) technology, as discussed on our page about Washington, D.C. 2000 baseplates. All plate types made on the 1984 base are described here except that non-passenger plates, issued in very limited quantities, are discussed separately below. OFM plates are divided into three categories (marked A, B, and C below), with up to three types within each category. By definition, embassy officials represent their country to the United States whereas mission officials represent their country to the United Nations. As is evident in photographs of 1984 baseplates shown on this page, as well as comments made above, there are four distinct styles of foreign embassy and foreign mission plates. 1. The first and earliest style, introduced in 1984, is characterized by silk-screen printed graphics that extend to the edges of the plate, an embossed registration number comprised of a two-letter country code and three numbers (e.g. AB 012 and 012 AB), and a legend at the bottom that begins with "Issued By The..." Pictured examples are PF 059 (embassy diplomat), QT 079 (embassy consul), KV 139 (embassy staff), and 043 FT (mission diplomat). 2. The second style is characterized by graphic sheeting that includes a narrow white space around the edge of the plate, an embossed registration number comprised of a two-letter country code and three numbers (e.g. AB 012 and 012 AB), and a legend at the bottom that begins with "Issued By And Property Of The..." Number YA 008 (embassy diplomat) pictured at the top of this page is an example. 3. The third and last embossed style is the same as the second except for that the serial portion of the registration number is comprised of four digits, not three. Pictured examples are XY0001 (embassy diplomat), DA0342 (embassy consul), SF0054 (embassy staff), and 0206QZ (mission diplomat). 4. The final style is characterized by a digitally-printed (i.e. non-embossed) registration number in the same format as the third style. Pictured examples are CM0076 (embassy diplomat), AV0271 (embassy consul), and 0011TY (mission diplomat). 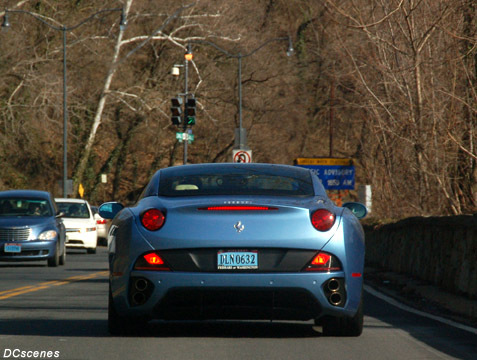 This is the most common category of OFM plate seen outside of New York City. 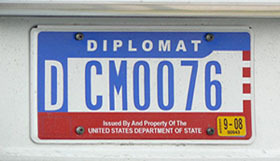 There are three types: Diplomat (D), Consul (C), and Staff (S), with the type designator letter positioned on the left side of the plate. 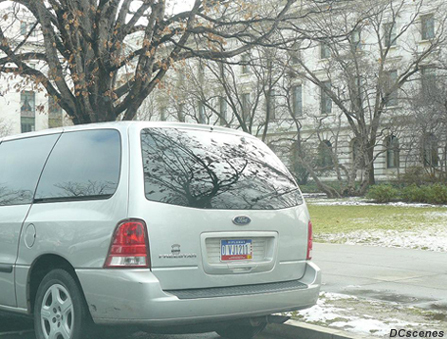 The use of Diplomat plates is confined largely to Washington, D.C., whereas Consul and Staff plates are seen everywhere that OFM plates are issued. Diplomat. 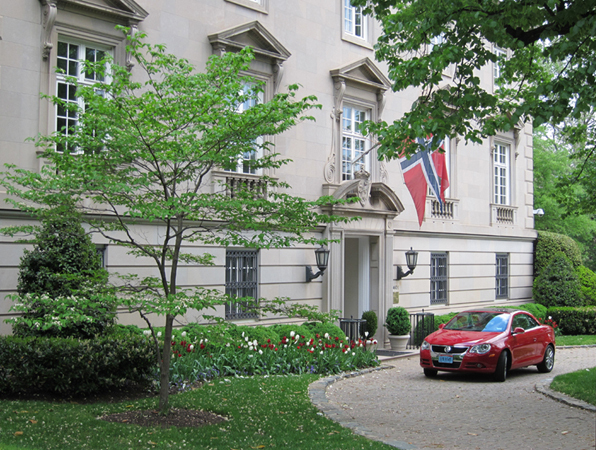 Because almost all embassies are located in Washington, their use is concentrated here. 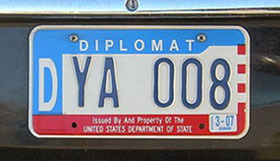 Plates of this type are “issued for vehicles owned by foreign [embassies] or official representatives to the U.S. having diplomatic status.” They feature the word DIPLOMAT across the top and a large, printed letter D type designator followed by a registration number comprised of two letters, which designate the country that the registrant represents, and three or four numbers. Registration numbers below 100 have leading zeros (e.g. AB 001). Earlier plates numbered below 1000 have a space rather than a fourth leading zero (e.g. AB 123), whereas later plates have a leading zero in the fourth (i.e. first) numeric position (e.g. AB0123). Consul plates are “issued for vehicles owned by foreign [embassies] and official representatives having consular status.” They feature the word CONSUL across the top and a large, printed letter C type designator followed by a registration number comprised of two letters, which designate the country that the registrant represents, and three or four numbers. Registration numbers below 100 have leading zeros (e.g. AB 001). Earlier plates numbered below 1000 have a space rather than a fourth leading zero (e.g. AB 123), whereas later plates have a leading zero in the fourth (i.e. first) numeric position (e.g. AB0123). Staff plates are “issued for vehicles owned by foreign [embassies] and official representatives not entitled to Diplomat or Consul plates.” The type name does not appear across the top. Numbering is in a format consistent with Diplomat and Consul plates. This is the most common category of OFM plate seen in New York City, although examples are seldom seen elsewhere. 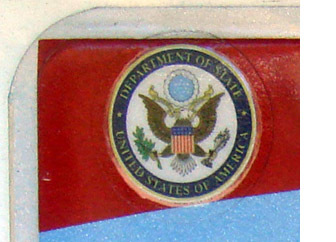 There are three types: Diplomat (D), U.N. Secretariat (A), and Staff (S), with the type designator letter positioned on the right side of the plate. All plates in this category have UNITED NATIONS printed in small letters on two lines in the upper right corner. By far the most common of the three U.N.-related types is Diplomat. Diplomat plates are “issued for vehicles owned by United Nations missions or officials of member states maintaining permanent missions at the United Nations headquarters.” They feature the word DIPLOMAT across the top and a large, printed letter D type designator following the registration number, which itself is comprised of three (or perhaps four) numbers followed by two letters that designate the country that the registrant represents. U.N. Secretariat plates are “issued for vehicles owned by the Secretariat or officials of the Secretariat of the United Nations as defined in Section 19 of the Convention in Privileges and Immunities of the U.N.” They feature the word DIPLOMAT across the top and a large, printed letter A type designator following the registration number, which itself is comprised of five numbers. Staff plates are “issued for vehicles owned by foreign missions, official representatives assigned to the United Nations, and family members.” The type name does not appear across the top. Numbering is thought to be in a format consistent with Diplomat plates. This plate type, “issued for official representatives to the Organization of American States,” is similar to the U.N. Secretariat plate type of the Representatives of Foreign Embassies category except that the three-digit registration number is in the 900-999 series. Note that UNITED NATIONS is not displayed on the plates. An official list of the two-letter country codes used on OFM plates has not been published in many years. However, various sources have provided either what is thought to be a complete list, or references to codes assigned to various individual countries, and from these sources we have compiled the information presented on a separate page that may be reached by clicking here. Temporary plates, likely made of cardboard, were introduced during 1984, presumably simultaneously with the introduction of regular plates. It is believed that motorcycle plates were also introduced at this time, but this has not been verified. According to a 2001 OFM report, in 1990 special plates for disabled individuals (with an HP type designation) and for use on trailers (presumably with a T prefix) were first made available. 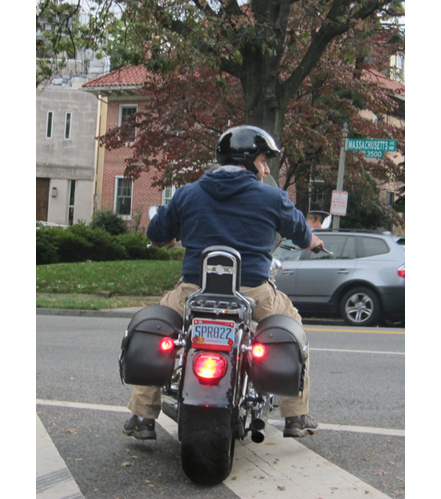 Although HP plates include the international symbol of access wheelchair motif used to make D.C. plates of that type in the 1980s and 1990s, as well as the letters "HP", they do not have an indicator of the country that the driver represented. Trailer plates of the 1984 base also likely did not include a two-letter country code. 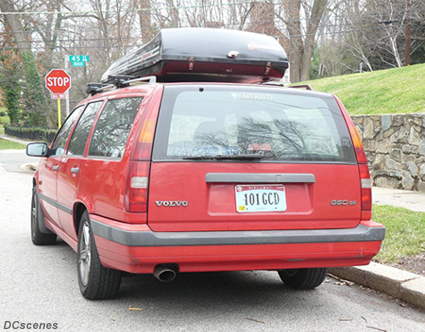 The OFM introduced the use of license plate validation stickers during 1992. Although we know that initially not all plates were validated, we do not know anything about the appearance of the first stickers. The earliest documented stickers on OFM plates closely resemble month and year stickers issued to validate Washington, D.C. plates, although the colors of year stickers are different and the serial number is prefixed by the letters “US” instead of "DC." In all cases, the design of these expiration year designation stickers (listed) is the same as stickers issued to D.C. residents but the color scheme is different, as noted. Expiration month designation stickers used on OFM plates during this period are the same as issued to D.C. residents. These stickers feature " USDOS" (for U.S. Department of State) printed vertically down the left side, the expiration month and year designation in the center, and a serial number across the bottom. Information about more recent stickers appears below. 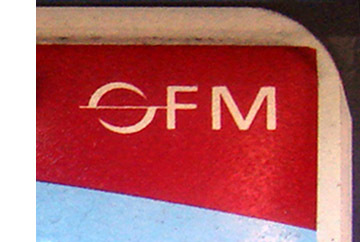 A new OFM baseplate was announced to the public on August 28, 2007, and began to be issued for new registrations on September 4. A general reissuance of 1984 baseplates began in November, presumably lasting through October 2008, and the final day of 2008 was the last day that 1984 baseplates could have legally been used. During the changeover, all 1984 plates had to be returned to the OFM in order for the new plates to be issued. According to an Oct. 1, 2007, OFM memorandum, “In exchange for the return of the old design plates, the mission will be given the newly designed plates with new registration card and decal. The expired license plates must be returned in order to obtain the newly designed license plates.” The new plates were distributed in Washington as well as the OFM's regional offices in Chicago, Los Angeles, Miami (Coral Gables), New York, San Francisco, and Houston. At the time there were 11,619 OFM-registered vehicles nationwide: 6,277 in the Washington, D.C. metropolitan area, 2,596 in New York City, 769 in Los Angeles, and the remaining 1,977 registered elsewhere in the United States. The change to a new baseplate was made, according to the OFM, “in line with the standard practice in motor vehicle departments to change plate design periodically, and to distinguish the State Department's plates from other jurisdiction's plates.” A public affairs officer for the State Department's Bureau of Diplomatic Security told a reporter in October 2007 that the change was not prompted by a specific security threat. Rather, said Kendall Smith, “there's been a proliferation of vanity plates that look exactly like ours, for instance the new Ohio plates. This change has been some time in coming. We've been talking about it for a year and a half.” The new design, which includes a distinctive light blue background, features the State Department seal in the upper left corner (in the form of a label as opposed to being a printed feature of the reflective sheeting) and the OFM's logo in the upper right. (See details below.) As is evident by dies used to emboss the registration number, the new plates are made by the state of Virginia. The OFM has a five-year plate procurement contract with the Virginia Dept. of Corrections that is reportedly worth about $300,000. These two consecutively-numbered Diplomatic Staff plates show the inconsistent use of leading zeros on 2007 OFM baseplates. The LC country code is assigned to the Consulate General of the Bolivarian Republic of Venezuela, and these plates were displayed on vehicles parked side-by-side outside of the Venezuelan consulate in Boston on May 5, 2011. They both appear to have a 2008 base sticker, suggesting that they were made and issued simultaneously to replace 1984 baseplates, which makes the inconsistent registration number format even more perplexing.